This grand building, once labeled the ‘German Cathedral’ is home to so many treasures. 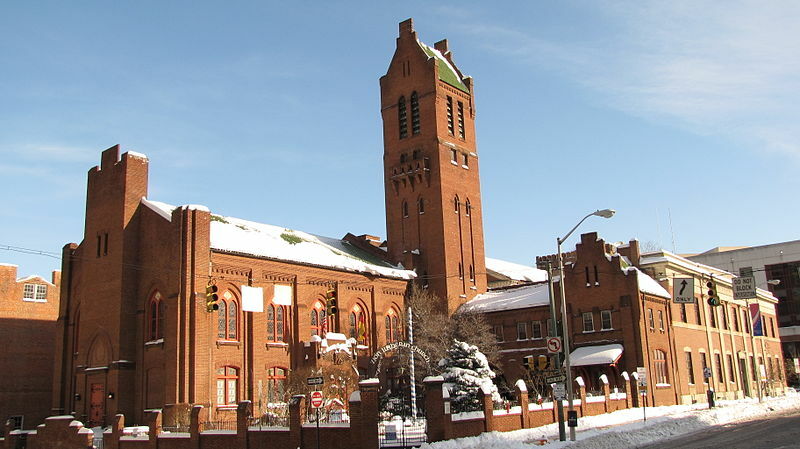 Initially called the ‘Evangelical Lutheran Congregation at Baltimore Town,’ when established in 1755, it has remained a ‘Beacon of Light’ to so many. The church was founded before we became this great country. The first building was nothing more than a log school house built by the congregation in 1762 a block north of the current building. The current building has proudly stood since at its current location since 1807. A fire destroyed all but the walls in 1840 and the church was rebuilt around those walls…if only those walls could talk. Zion opened her doors and her heart to the many German immigrants who landed US shores during the three major waves of European immigration. She fed their souls in their native tongue and helped them acclimate to their new country. So much history has transpired over her 262 years. Her walls witnessed first-hand how prejudice and fear hardens the heart toward those who speak and act differently. Zion embraced and loved during these difficult times. She withstood many tribulations and battles. One of her biggest trials was to remain a beacon of light for the German-Maryland community during the World Wars. She accomplished this, but not without battle wounds. Zion and her people were dedicated to their new country, but it wasn’t uncommon for their Sunday school picnics, their services, their very beings, to be thwarted by those wishing to close her doors and rid the country of the Germans. One group even proposed removing her eagle that graces the parish house entrance. It was a German Eagle and had no place in Baltimore. The eagle was completed by Hans Schuler in 1913. The then Pastor Hoffman, refused. Look closely at that eagle. 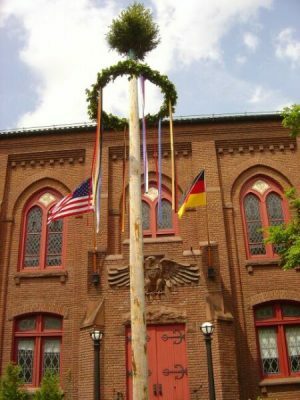 It is an American eagle with the German eagle within the heart—a symbol of the German immigrant at the heart of America. The parish house, built in 1912, became a respite for weary Germans. It was here that Zion’s family formed the Patriots in service, which among other functions operated as a road stop for soldiers and sailors coming from or going into harm’s way during WWII. Here they made care packages and raised enough money to present the American Red Cross with a brand new ambulance, called ‘the Pioneer.’ Today, the German American community continues to meet in the parish hall for the many ethnic events. The sanctuary holds many historical treasures including an odd centered pulpit resembling a ship and crow’s nest that honors German immigrants. Erected in 1840, the pulpit and pews bear the names of early congregants. The wall behind the pulpit represents earthly and heavenly justice with woodcarvings of St. Michael the Archangel and Roland the patron saint of Germanic nations. The side walls also reminds visitors of the church’s early German roots by the flowing stencils of scripture, originally done in 1895 and restored in 2006. The stained glass window dedications proudly recall and honor the many early congregants. Take a peek in the library, founded in 1904. Visit her garden that has become a place of solitude for so many people working in Baltimore’s downtown business district. Zion opened her gardens to provide a place of safety during the recent Baltimore riots. Here the stone arcade provides shelter during a storm, as Zion herself has done for so many. Zion, to me, is comfort. Of course, it is a house of faith and that is comfort in itself, but it is full of treasures—comforting treasures of Baltimore, of Maryland, and tangible reminders of our German-American heritage. I say comforting because Zion has survived. It has served and continues to serve as that beacon of light in inner city Baltimore. Throughout the entire building are sweet reminders of the many who have led the way. Her bells, aptly named, Faith, Hope and Love call us to worship every Sunday and remind us of the treasure called Zion. There is so much to see and so much history that it cannot be told in one brief letter of love. Join Zion for one of their Historical Tours (2017: February 12th, April 9th; June 11th; September 10th and November 12th). Tours are offered to groups as well and can be done in English or German.